As she swings through the sky. This entry was posted on July 20, 2012 by Robyn Lee. It was filed under Children, Summer 2012 and was tagged with candid, childhood, children, energy, free spirit, health, innocence, love healing, nature, photography, play, poetry, pure, Robyn Lee, spirit, swing, yard. Thank you Julie… so that is our new collective goal ~ tapping into the free-spirited wise souls we truly are at our core. It is amazing how hard knocks of life can get in the way of our true selves. I’m glad the post could bring that up for you. You are so sweet to compliment my writing Professor Julie…but I think you are just trying to make my day when you say that stuff (blushing), so you succeeded 🙂 xo Loveya back!! I’m not a professor, only a phd doctor and if you call me a professor again I will start calling you Dr Robyn! Not trying to make your day at all – mean it all sincerely. You can bloody write kid! Ok – now you are making me laugh, and making my day too! Well… ok – I’ll accept then — such a compliment from you, as any ph d who has taught college level English/writing and published a book is called a professor in my book! Oh – and many of my friends and family do consider me a Medical Doctor based on the level of education I’ve had to inflict upon myself given my history. Get consulted all the time here 🙂 I have subspecialties in so many things too… Medical Textbooks all over the house. Should do a post one day — would be funny and or sad … Love you Julie! Love you too, Dr Robyn!!! 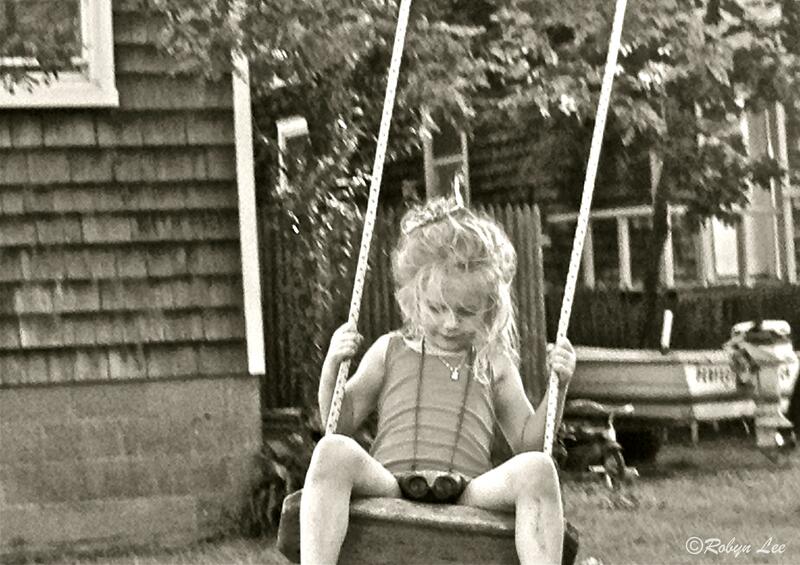 Beautiful poem and the lovely child swinging in gay abandon – exhilarating. Thank you! Such a sense of whimsy here, Robyn….and she looks quite familiar…but maybe I’m wrong? Swings and binoculars.. what more could a girl want?? I think this may be my favorite piece of yours! Love, love, loved it! Oh, the childhood memories just came flooding back. Great work! Now I’m blushing Francis 🙂 …thank you so much ~ means a lot, and hope you are hanging in!! Your photo and verse captures the young care-free days of Summer to me. Thank you for the memories. You are so talented and gifted in all the above mentioned areas in my first comment and what I just said about smiles, inspiration, and happiness as well…You bring joy and light to so many people. I just wanted to say today that I appreciate you so much sweetest friend!! Huge hugs and Blessings for a wonderful evening and tomorrow!! Just beautiful! Your words are lovely and powerful. Sometimes my inner child beckons me back to a time of carefree innocence, free of challenges, pain and health issues — it’s a nice respite occasionally to think back to those times. Beautiful verses and a priceless photo! You are welcome Robyn. How are you feeling today? Wish that every days gets a bit easier for you gorgeous! I am sorry to hear that… I know I am a perfect stranger, but I want you to know that my good thoughts and prayers are with you. Thinking of you… Blessings! I LOVE swings always have, always will. What a gorgeous little girl in the photo…..goes perfect with the poem, a poem that was so sweet and full of joy…..thank you for the blessing, my friend! This is beautiful! And the picture is perfect. I wondered whether the poem inspired the photo or if the photo inspired the poem until I read your reply to Celeste. Love this! I think you should! I’m sure they’d love that!! I just may — I know I would love it if it were me or my own children. I’m sure they would too!! thanks so much for that!! Yes me too Erin! Such joy associated with that memory. I actually still have my own swing hanging on a Red Maple tree in my yard! I haven’t been on it as of late, but it is a reminder to me of that “weeeee” feeling 🙂 Much Love to you – thank you for coming by tonight ! !